I made this pattern earlier today to use somehow in our decorations. And I couldn’t stop thinking about that phrase. 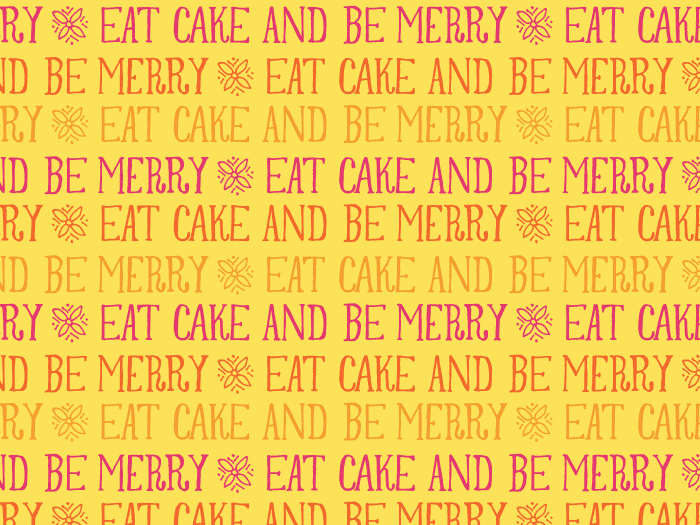 EAT CAKE AND BE MERRY. It’s 32 days until our wedding. I’m now in that stage of the planning when fretting over what’s going to go on my tables at the reception, altering my dress, and 500 other minute little details that keep me up til 5:00 in the morning fretting. But I manage to calm myself down when I picture Dave and me at the reception eating cake. I can’t express to you how much that thought brings me incalculable joy. I remember being a kid going to weddings at my church where the reception would be at the church. I would get SO excited about those pastel mints that melted in your mouth and the CAKE! Weddings used to be about, well, you know… THE MARRIAGE. They were such simple receptions. Cake, chicken salad, tea, mints. NOW there are hundreds of websites dedicated to making brides feel this obligation to make their wedding this huge statement about themselves. If you don’t hand-make all your place cards, then you are not that thing – cool, hip, indie, trendy, and just all around awesome. I feel so much extra pressure because I know I am capable of doing every single little thing to such an elaborate degree. I’m a designer and I love making stuff. There are going to be a few awesome things about our wedding. But everything is not going to be over-the-top crazy fiasco thing featured in Southern whatever magazine. And that’s okay! All I want to do is eat cake with Dave and be merry! Isn’t that all we really want to do at a wedding? I think there is something seriously wrong in our society with the way we have elevated weddings to such a level that we have lost the whole purpose of a wedding. I having to continually remind myself of all these things when I start freaking out about what we’re going to use for a guest book!